We've already seen Samsung's hottest device of late, the Galaxy S5 and the Galaxy S4 flagships, running on Samsung's TouchWiz-y take on Android 5.0 Lollipop in an abundance of videos and screenshots. What's more, both of said handsets have already been graced with unofficial, bug-infested builds of stock Android 5.0 Lollipop. 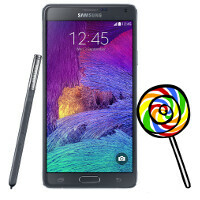 Well, it was high time that Samsung's arguably best mobile device to date, the Galaxy Note 4 S-Pen knight, got caught in the wild running its own Lollipop-TouchWiz concoction. And we have some pictures to prove this. In the photos below, we can purportedly see a Note 4 phablet with a slightly-refreshed TouchWiz Nature UX 3.0, which has been slightly revamped in accordance to the Material Design and Android 5.0 Lollipop guidelines. Without a doubt, we're dealing with an early firmware build which is not intended for the wide public, yet it serves one pretty important purpose - it reminds us that the phablet will be among the first devices bearing the Samsung logo to be officially treated to the most recent variation of Google's popular mobile platform. The Samsung Galaxy S5 is said to receive its own build sometime in December, and we suppose that the Note 4 won't trail behind by a margin. Looks more like TouchWiz than Android 5.0 Expect a heavy dosage of TouchWiz hogging up everything. Of course it looks like Touchwiz. That's exactly what it is. Logic isn't & never will be one of your strong suits. Do you ever stop being ignorant? and do you ever stop being too purist? Do you ever stop being a trolling idiot? I'm not even sure why I asked. We all know the answer is no. Do they give you a badge for being part of the Samsung Defense Force? Stop being an idiot. Being a poster with more than 4000 posts, and yet you expect Galaxy Note to have pure Android! It's basic commonsense. Nobody can teach that. Wait, he is ignorant but you are not by saying "Looks more like TouchWiz than Android 5.0"... You know it's on the SAMSUNG Note 4, you know Samsung devices are made to have TouchWiz. I mean it's like saying HTC won't add Sense to their Android 5.0 Lollipop build. C'mon, this is PURE tolling at it's finest. Even you can't argue that. We've both frequented this site long enough. You know the idiot troll will find a way to argue it regardless of how stupid or illogical it may sound. His trolling is about as inevitable as the sun rising. Someone call the Waaambulance for this guy. I sense some heavy crying going on here. Even your canned responses have lost all meaning. Relevance, man. Look it up. Relevance is what Samsung is slowly losing. Tell that to Apple's worldwide market share. Sinking ever so closer to Blackberry. What a shame. Because Apple becoming the most valuable company in the world says nothing. Lol are you done now? Give me your address, so I can send you a dictionary for Christmas. You clearly have not heeded post #39. I never at once said anything about Samsung devices not being made to have TouchWiz. You're just spewing bs. I am saying they should tone TouchWiz down and stop cluttering it up with so many useless features and menus. I expect it to remain the best big smartphone available. What a nonsense comment. You expect it looks more like iOS than Android? That's what they said before.